Illegal employment discrimination on the basis of criminal convictions is more common in New York than many want to believe. For those with criminal records, especially felony records, reintegration into society can be very difficult. If you have a criminal record, do not lose hope that you will be treated fairly be employers. But if you have been stigmatized by your prior conviction in the job market, you should get a labor lawyer nyc free consultation to determine if you have a legal claim. People with prior convictions have difficulty in restoring their civil rights to vote and carry firearms, among other rights. However, often the most difficult facet of a prior felony conviction to overcome is the “criminal” stigma, especially in the job market. Discrimination on the basis of criminal history is, unfortunately, very common in modern society. Many employers use the fact that one has a criminal record as a screening tool for new applicants even if the criminal record has no bearing on the nature of the job. Unfortunately, many employers hold the unfounded view that once an individual has been convicted of any crime, that individual is inherently undependable or irresponsible without determining whether that view is true. This is the case across the United States, and in New York, many of the most desirable jobs are closed off due to this criminal conviction discrimination. In many cases, such discrimination based on criminal history is legal; however, in just as many cases, if not more, it is illegal. This subject is quite complicated in the context of labor and employment law; however, this article seeks to explain the subtle nuances between legal and illegal criminal conviction discrimination. Before explaining the nuances of criminal conviction discrimination law, it is important to lay the foundation by explaining what a criminal conviction actually means. A person with a criminal conviction is someone who has been convicted of either a misdemeanor or felony. Simply because someone has been arrested does not necessarily imply that the arrested individual committed any crime. Many arrests never result in a conviction. Under New York law, an employer cannot deny you a job or terminate your employment due an arrest if you have not been convicted. Specifically, the New York State Human Rights Law and the New York City Human Rights Law prohibit employers from denying an individual a job (or otherwise discriminating against that person) because of any arrest that did not result in conviction, as well as prohibits employers from asking job applicants to disclose any arrest that did not lead to conviction. However, this law does not apply to police or other law enforcement positions, as law enforcement agencies are authorized to ask applicants about all arrests, whether or not they led to conviction. The hiring or continuation of employment of the individual would involve an unreasonable risk to property or the safety or welfare of specific individuals or the general public. For example, if a job applicant was convicted of reckless driving and the job that the applicant has applied for would involve considerable driving, that would be a close enough relationship to deny employment on that basis. The second exception (unreasonable risk exception) tends to hit violent felons the hardest, as many employers will require a job applicant with a prior violent felony to prove that they are no longer a threat to society. When a private employer relies on the unreasonable risk exception in determining whether to grant employment to an ex-offender, the employer must consider eight factors that are included in the statute before making any decisions. An employer cannot simply presume an unreasonable risk exists. Instead, employers must consider each statutory factor and cannot ignore evidence favorable to the applicant. Similarly, an analysis of a “direct relationship” also requires that the private employer analyze the eight factors to determine if, notwithstanding the existence of a direct relationship, it should, in its discretion, approve the employment sought. In New York City, the laws are even better for employees. Under the New York City Fair Chance Act (“FCA”), more commonly known as the “Ban the Box” law, New York City employers with at least four employees are prohibited from inquiring about a job applicant’s criminal history until after a conditional offer of employment has been made to the applicant. An employer may not inquire about an applicant’s criminal history or request permission to run a criminal background check until after the employer makes the applicant a conditional offer. Employers also cannot make an inquiry or explore information about pending criminal charges before a conditional offer of employment is made. Further, an employer can never require an applicant to disclose, nor may it consider, non-convictions, such as criminal accusations that were terminated in favor of the applicant, were adjudicated as a youthful offender, or resulted in a sealed conviction. One of the most common questions we receive from clients regarding criminal conviction discrimination is whether it is illegal for an employer in New York to ask about an arrest not followed by a conviction (acquittals, declines to prosecute, and voided arrests). Unless the criminal charges are still pending, it is illegal under New York law to ask about an arrest that did not result in conviction. Sealed convictions; including violations, infractions, and misdemeanors and felonies sealed under the conditional sealing law included in the 2009 Drug Law Reform Act. There are exceptions to these limitations on conviction-related questioning in job interviews. Certain employers are allowed, by law, to ask you any questions they want about past convictions. In general, law enforcement agencies, federal government agencies, and the Port Authority may ask about any convictions and can even ask about sealed convictions. For these jobs, you must list any arrests that you are asked about, including those that did not result in a conviction. What Information Do I Have to Give Employers (if in NYC, Only After a Conditional Offer of Employment is Made)? Except for what is mentioned above, an employer in New York can ask you about any convictions that you may have as long as the convictions are not sealed. You are under an obligation to provide truthful answers to an employer’s questions about your past convictions. Lying during a job interview can be an independent reason to legally not hire you, even if the question is about past convictions. That is because in order to be protected by New York State anti-discrimination laws, you must disclose ANY unsealed convictions IF an employer asks about them. Keep in mind that because you will not receive protections from the New York law if you lie during your job interview, you should study your criminal record to make sure that you know what convictions you have. It is quite common for people with criminal convictions to believe incorrect information about their records. If you are unsure what information your criminal record contains, you should request a copy for yourself. Criminal conviction discrimination takes many forms, but occurs most often during the hiring process. Lying to job applicants about their rights as someone with a criminal conviction in the hiring process. “Smoking gun” evidence of employment discrimination is rare. Most employers who intend to discriminate will often be good at hiding any evidence and employers who do not intend to discriminate but do so anyway will be unlikely to leave a large amount of evidence. That said, once you understand the signs of possible criminal conviction discrimination, you will be able to spot it in the hiring process. Biased statements about people with convictions: Look for derogatory comments about people with criminal convictions. Similarly situated comparators: A comparator is someone who is in a very similar situation to you but with an important difference. The fact that one of two similar persons was treated differently than the other can serve as evidence of discrimination. For example, if three individuals apply for two open job spots and all three applicants are identical except for one with a criminal conviction, a situation where the applicant with the conviction is not hired could evince illegal discrimination. Your first step should be to consult with lawyers that litigate employment discrimination cases to determine if you have a criminal conviction discrimination case. Meeting with an experienced criminal conviction discrimination attorney for a free consultation can help you understand both the nature of your convicted criminal discrimination case and the legal options available to you. If you were denied employment, request a letter from the employer stating why you were not hired. In fact, Section 754 of the NY Correction Law states, “At the request of any person convicted of one or more criminal offenses who has been denied a license or employment, a public agency or private employer shall provide, within thirty days of a request, a written statement setting forth the reasons for such denial.” If the excuse does not hold up under scrutiny, that could indicate a discriminatory motive. Document any statements made by the employer related to your conviction. These statements can include offhand comments about people with convictions or may be hidden code words. If the statement comes in written form such as in a letter or an email, keep it. If the evidence is based on an oral statement, do your best to remember it word-for-word and write it down as soon as you can. The best practice in such a situation is to type the statement electronically in some form that has a time stamp such as a text message so your attorney can prove the time and place in court. Photograph any images or displays that indicate possible criminal conviction discrimination such as cartoons about criminals. Check for past records of discrimination and ask your co-workers about your employer’s discriminatory tendencies. Chances are, you are not the first victim of criminal conviction discrimination. Review and photocopy any relevant personnel policies. If your employer did not follow an applicable policy, it may be evidence there was an illegal motive. There are no federal laws that explicitly prohibit employment discrimination based on a criminal record. Under Title VII of the Civil Rights Act of 1964, an employment hiring policy that results in racial discrimination is illegal even if the policy was not intended to discriminate. This is known as disparate impact discrimination. Disparate impact discrimination occurs where an employer’s policy, even though it does not address race, national origin, religion, gender, age, or disability, results in discrimination against one of those groups of people. For example, a workplace policy that requires a minimum height for employees may be illegal discrimination against women, because women are, on average, shorter than men. 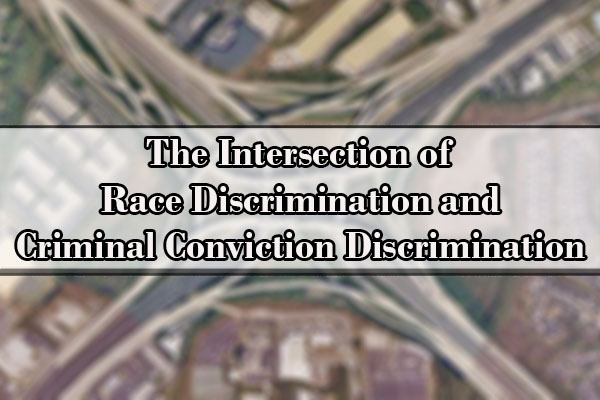 In the context of criminal conviction discrimination, a policy against the hiring of people with convictions could become disparate impact race discrimination. This is because a disproportionate percentage of African Americans and Latinos have criminal records compared to Caucasian individuals. The statistics show that African Americans are seven times more likely to be convicted of criminal offenses than Caucasians, and Latino individuals are almost twice as likely to be convicted. As a result, policies that ban people with convictions from working in a job could be racially discriminatory. For example, assume a store is seeking to hire a new clerk and is interviewing ten applicants. Of those applicants, four are African American and six are white. Three of the African American applicants and one white applicant have criminal convictions. Before those with criminal convictions were screened, there was a 40% chance that an African American would be chosen for the position. Once applicants were screened for criminal convictions, that chance dropped to 17%. All disparate impact analyses for race discrimination are fact-based. In order to determine if an exclusionary policy has a disparate impact on individuals of a particular race, statistics need to be provided to show a hiring disparity. In many cases, the screening of people with prior convictions will not result in a disparate impact case; however, in some cases, that may be the result. The U.S. Equal Employment Opportunity Commission (“EEOC”) has published Enforcement Guidance that explains how employers should evaluate a job applicant with a criminal conviction. The guidelines seek to help employers differentiate between arrests and convictions and help to determine when a conviction may be related to a job (for example, if a person applying to work as a cashier was found guilty of stealing from the register of a former employer, that conviction is more job related than if the conviction was for drug possession). Q: May an employer deny me a job because of my criminal record? A: Yes, you can be denied a job because of your criminal conviction record if there is a direct relationship between your previous criminal convictions and the specific employment position you are seeking; or if the employer has a good faith belief that hiring you would involve an unreasonable risk to property or the safety or welfare of specific individuals or the general public. 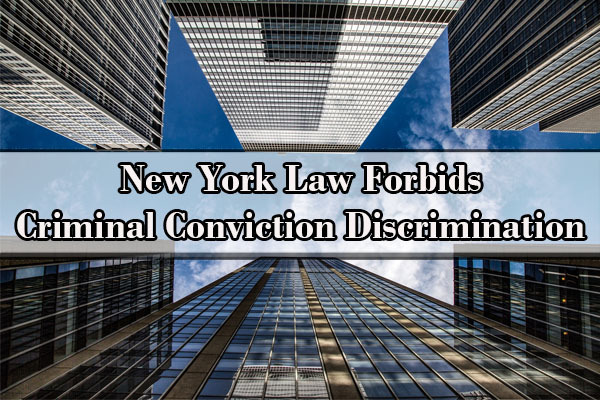 It is illegal under New York State law for an employer to deny you a job, fire you, or discriminate against you because of your past arrests that did not lead to a conviction, sealed convictions, or youthful offender (YO) adjudications. Q: Does it matter what my conviction is for? A: Yes. For example, if you were convicted of vandalism twenty years ago and have had no subsequent convictions, it is much harder for your employer to claim that he or she thought you would be a threat to the business or to public safety. Q: Should I tell the truth about my criminal convictions on a job application? A: Yes. Tell the truth. It is tempting to lie, but more and more employers are running criminal background checks, so they likely will find out anyway. If you lie, the employer can legally deny you the job or fire you because you lied. Q: How much should I say about my convictions? A: Again, you have to disclose the existence of any felonies and misdemeanors that are not sealed, but only if the employer asks. DO NOT LIE to the employer! That said, you only need to answer the question that is actually asked. For example, if the job application simply asks you to list your prior convictions and does not require you to explain how you were sentenced, you do not need to disclose any information about your sentence. Q: What should I do if employers ask an illegal question? A:If employers ask an illegal question – for example, questions about arrests that did not lead to convictions or about sealed convictions or any questions in NYC before an offer is made – you are not required to answer. BUT, as explained above, DO NOT LIE. If you believe that a question is not allowed to be asked, you should decline to answer the question and tell the employer that you know your rights. 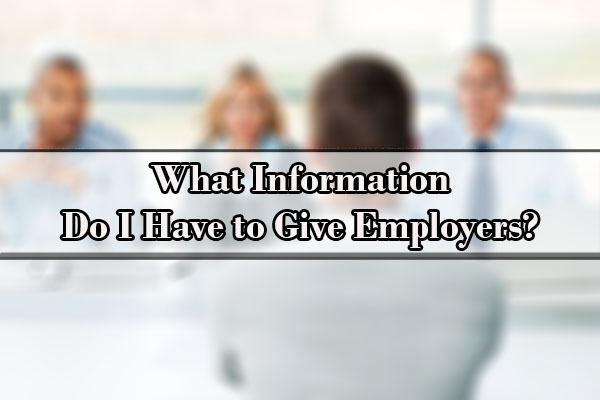 You are only required to disclose information to an employer that the employer is allowed to ask about. Q: Will employers get my record through a background check? A: Not necessarily, but just to be safe, you should always assume that an employer will get your record through a background check. Employers who are permitted to do fingerprint-based background checks will see any arrest that has not been sealed or made confidential. Most employers get criminal record information through commercial background check companies. Before running a background check on you, employers must first get your permission in writing. In New York State, commercial background check companies can only give information about arrests that led to convictions for crimes. Background check companies should not report arrests that did not lead to a conviction. They also should not report adjudications because these are not convictions. Nor should they report offenses, violations or infractions because these are not criminal convictions. Q: Do I have the right to see my background check? A: Yes. If an employer fingerprints you, you are entitled to a copy of the results. If an employer gets a commercial background check, the employer must give you a copy before denying you a job based on information in the background check. The employer must also give you a “reasonable” time to challenge any mistakes. Q: What can I do if the background check is wrong? A: If the information on the background check is wrong, try to correct it as soon as possible. You may bring proof to the employer and ask the employer to change its decision. You will probably need a copy of the court record with the correct outcome of your case. Additionally, contact the background check company immediately and demand that they correct your report. The federal Fair Credit Reporting Act requires them to correct mistakes. Have you ever been denied a job because of your criminal record? Do you believe that society unfairly discriminates against people with prior criminal convictions? If so, we would like to hear your story. 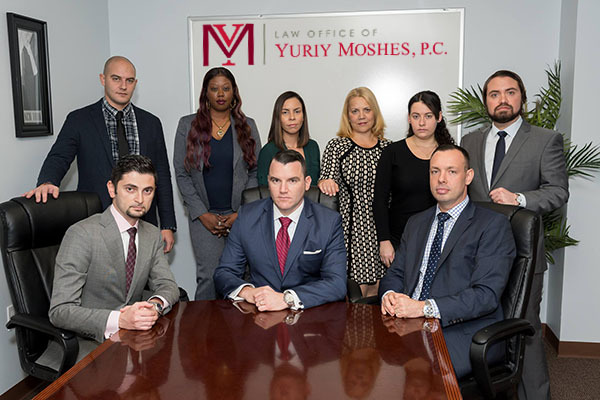 The Law Office of Yuriy Moshes is a full service employment law firm with offices in New York City and New Jersey. We offer white-glove customer service to all of our employment discrimination clients, which means that we will never stop fighting for your rights. We offer free consultations to all victims of employment discrimination. Even when an applicant with a criminal history has shown extensive rehabilitation efforts and good conduct since the offense in question, many employers still nonetheless discriminate against, and refuse to hire, applicants with criminal records. As such, in 2015, New York City enacted the Fair Chance Act (“FCA”), more commonly known as the “Ban the Box” law, and on August 5, 2017, the New York City Commission on Human Rights’ Final Rules and Regulations (“Rules”) for the FCA went into effect. Under the FCA, employers with at least four employees are prohibited from inquiring about a job applicant’s criminal history until after a conditional offer of employment has been made to the applicant. An employer may not inquire about an applicant’s criminal history or request permission to run a criminal background check until after the employer makes the applicant a conditional offer. Employers also cannot make an inquiry or explore information about pending criminal charges before a conditional offer of employment is made. Further, an employer can never require an applicant to disclose, nor may it consider, non-convictions, such as criminal accusations that were terminated in favor of the applicant, were adjudicated as a youthful offender, or resulted in a sealed conviction. Requiring applicants or employees to disclose information about an arrest that, at the time disclosure is required, did not result in a criminal conviction. If an employer inadvertently learns of an applicant’s criminal history without solicitation or inquiry before a conditional offer is made, as long as the employer does not inquire further about the criminal history or use the information for hiring purposes before making a conditional offer of employment, the employer will not be liable under the FCA. After an employer extends a conditional offer to an applicant, an employer may (1) ask, either orally or in writing, whether an applicant has a criminal conviction history; (2) run a background check or, after receiving the applicant’s permission and providing notice, use a consumer reporting agency to do so; and (3) once an employer knows about an applicant’s conviction history, ask them about the circumstances that led to the conviction and gather information relevant to the Article 23-A factors. Provide the applicant with a reasonable period of time (which must be three days or longer) in which to respond to the report. In this process, the employer “must affirmatively request information concerning clarification, rehabilitation, or good conduct while engaging in the Article 23-A analysis.” The employer also has a duty to hold the position open while the applicant gathers this information. Consider any additional information provided by the applicant and provide a written final determination addressing any such additional information provided. If an applicant realizes that there is an error on a criminal background check, they must inform the employer of the error and request the necessary time to provide supporting documentation. If a background check reveals that an applicant has intentionally failed to answer a legitimate question about their conviction history, the employer may revoke the conditional offer or take an adverse employment action. Withdrawal of the employment offer would still need to comply with the FCA. While temporary help firms must comply with the FCA, these firms may only consider the minimum skill requirements and qualifications necessary in order to evaluate convictions to determine whether they are job-related. Temporary help firms cannot make determinations about an applicant’s suitability based upon an employer’s preference to disqualify individuals with specific types of convictions. There is a rebuttable presumption that a withdrawal of a conditional offer of employment was motivated by an applicant’s criminal history. In order to rebut the presumption, employers can show that the withdrawal was based upon a permissible physical examination, material information it could not have reasonably known before extending a conditional offer, or evidence that the employer had no knowledge of the applicant’s criminal history prior to rescinding the offer. If you were denied a job due to your criminal history, we recommend consulting with a New York City employment discrimination attorney to determine whether your legal rights were violated. Disclaimer: This article is not to be construed as legal advice. Every case is different, and we cannot provide legal advice without an in-office consultation. Additionally, this article should only be utilized as basic information about New York State law.